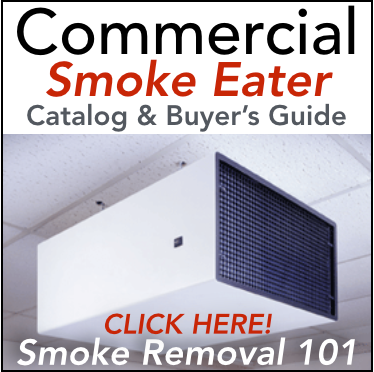 Welcome to our Smoke Removal Video Guide! Let's get right into it... As soon as you finish watching the first video, continue on to the others and you'll be able to make an informed decision on your specific problem by the end. In this video we take a look at all of the differences between electronic smoke eaters and filter-based smoke eaters. We compare the pros and cons and help you decide which is best for your application. There's a bit of math required to determine how many machines you'll need. In this video we go over the formula we use on every single job to find this. Don't want to do the math? Request a quote with your specs and we'll make a custom recommendation for you! Should I Use UV Light? UV lights are an amazing tool for dealing with smoke odors. These are optional additions to our smoke removal systems, but they can provide some assistance in removing gasses, fumes, and odors. Give us a call to learn more! In this video we talk about how to position your smoke eaters for optimal airflow and efficiency. Turbulence in the air can cause problems and we want to make sure smoke isn't getting trapped in a "dead zone". Have more questions about layout and installation? Check out the next video and give us a call at the number above. You may need to enlist the help of an electrician or your HVAC guy, but it's pretty straightforward. 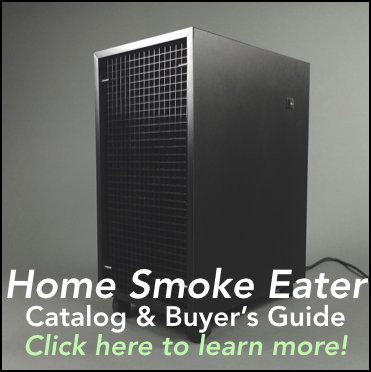 In this video we cover everything you'll need to know about installing your new smoke eaters. Ready to get started? Request a quote below. Maintenance on our machines is very straightforward. It comes down to a quick 5-minute filter change once per month. That's it. If your smoke levels are very high, you may have to bump this up to twice a month to keep the air flowing. Stay on top of this and you're good to go. As long as you're changing your filters and keeping up on maintenance, we warrantee the parts on our machines for 10 years. And if you follow our recommendations, you have a 90-day satisfaction guarantee. If you're not satisfied, we'll take the machines back - dirty filters and all. 100% unconditional money back. See the full guarantee here. Media smoke eaters are machines that use filters to capture smoke out of the air. These are the only type of machines that we will recommend and sell, and if there was a better option out there, we would sell them, but that's just not the case. These machines have been working for our clients for years and we will swear by them. Ozone machines have become outdated. They can cause headaches and discomfort to anyone in the area. They're dangerous and inefficient for smoke removal. UV lights are a much better option when it comes to handling smoke odors, and we'll talk more about those in the next video. Our commercial UV light systems are designed to be installed into your ductwork and will work to fight against the gasses, fumes, and odors in your space. They do not capture any physical particles, but when paired with a filter-based machine you get the best of both worlds. Our commercial smoke eaters will handle odors as well, but these UV lights are nice, optional additions to your space if you're especially concerned with odors. Electronic smoke eaters are the other main type of machines that are being sold. However, there a few key reasons why they're not the right choice for you and why we won't even sell them. They're tough to clean, don't work as well over time between cleanings, require time and expensive chemicals to clean, and don't handle odors. Our disposable media filters are much easier to swap out every month and they will work like new every time you do. Electrostatic filters use static electricity to capture any particles passing through. Unfortunately, these filters are inefficient and only capture about 60% of the particles. For this reason, we do not recommend them. Our machines use multiple stages of filters that will capture 95% of all smoke particles on each pass and even odors with our carbon media. Our polarized media filters are direct replacements for the standard air filters common in most heating and AC systems. A charge is applied to the filter with a standard wall outlet and this will help it attract any particles passing through, similarly to the electrostatic filters, but not relying on static and with much better capture rate. That, coupled with an odor-removing sheet of carbon inside the filter, will improve the air quality of any space by simply slipping this into your HVAC system and plugging it in. A perfect addition for any situation. We have a ton of experience with smoke removal in bars. We've even been featured on the SpikeTV hit show "Bar Rescue" twice! Get in touch today or request a quote to learn more and get started! Not too many restaurants still allow smoking, but some are still out there and it can be a real challenge to deal with the smoke inside. Creating a good airflow is key. Learn more in the video and get in touch with any questions on your specific needs. Very similar to bars and our other commercial applications, these spaces are generally pretty straightforward for us to work with. However, many VFW Halls and Eagles Lodges can be very unique. Please request a quote at the link below so we can make a perfect recommendation for you! Cigar shops can be tricky... Cigars put out much more smoke than cigarettes, especially if you're holding tasting events or even if you just have a lot of customers in and out of the store. This increased volume of smoke requires more power to clean the air. Airflow can also be managed to help clear some of the smoke. Request a quote now for a detailed recommendation on your specific space. Bingo halls and casinos are incredibly large spaces that can get very smoky and tough to manage due to the size. We have great experience working with these businesses and have been able to put together systems with great success for customers across the country and even overseas. It all just comes down to more power and treating the whole space, much like you would with air conditioning. Request a quote now and we'll start planning out your perfect solution to get the smoke out. Most smoky offices are no bigger than a standard room and would be much too tight for a big, powerful commercial machine. For these types of situations we recommend our Smoke Stomper Home Smoke Eater. This is the same technology used in all of our commercial applications, but downsized for your home or office. Click here to learn more. Thanks for checking out our video training series! If you have any further questions, or if you want a custom recommendation for your space, give us a call or request a quote now!